Centered on the 511nm wavelength and passing the narrow 8.5nm bandwidth, the Alpine Astronomical Baader 8.5nm Oxygen-III Enforced-Narrowband CCD Imaging Filter is ideally suited for use with full-frame CCD imaging sensors on optical systems, including telescopes of all configurations and apertures, ranging from a super-fast f/2.8 to a more moderate f/10. By passing just the narrow O-III band and excluding all others, this filter improves the contrast of faint and wispy planetary nebulae against the stark black backdrop of space. 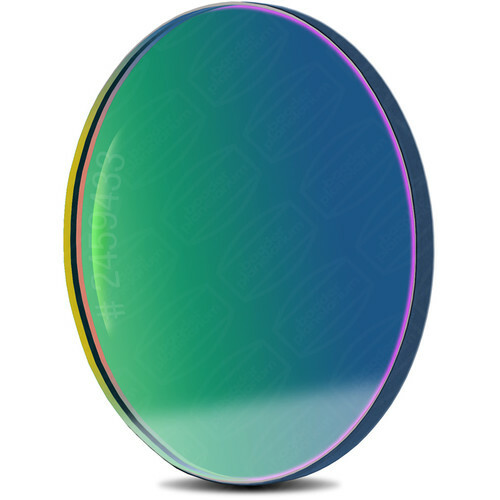 Individually planeoptically polished, dielectric anti-reflection coated, and IR blocked, the filter uniformly passes the maximum amount of bandwidth possible to virtually eliminate halos, reflections, and ghosting. It is offered here in a 36mm round unmounted version for custom configurations and imaging rigs. It is ideal for long-exposure CCD imaging to produce composite photos when stacked and matted with multiple exposures using multiple band filters. This filter is intended only for deep-sky astroimaging with CCD systems, and should never be used for direct solar viewing or solar photography as permanent injury to your eye and equipment can occur, up to and including blindness.